We hope this finds you well. March 2019 certainly has a spring in its step with much happening across the SECAS team. We were pleased to host our bi-annual seminar ‘Introduction to the Smart Energy Code’ earlier in the month where we welcomed new entrants to the Code. Our Change Team have begun their series of ‘Modcasts’ which we hope you will enjoy (see below). 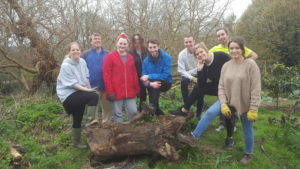 And finally, SECAS enjoyed a day of volunteering at Streatham Common Community Garden where much useful weeding and planting was done! Please read on to find out more about SEC developments. In this final piece of our four-part series on the new Development Stage of the Modification Process, we look at how a Draft Proposal is converted to a Modification Proposal, and how a well-defined problem statement supports the rest of the process. Click here to read the full article. If you would like to attend please email us at sec.change@gemserv.com. You can find further details here, where we will be publishing meeting materials in advance of the meeting. Our first Modcast went live last Friday, providing an update on the changes we are making to the SEC Modifications Process in response to the feedback we have received – click here to listen. Keep an eye on our website tomorrow for our next episode! It will provide you with a snapshot of the key activities taking place regarding SEC modifications and what you should look out for in the next week or so. If you have any questions, comments or feedback on the new Modcasts, please contact our Change Management team at sec.change@gemserv.com. a further consultation published on 12 February 2019 on the approval of the User Testing Services Approach Document for SMETS1 Services (UTSAD) and the re-designating the Enduring Test Approach Document (ETAD) and the Common Test Scenarios Document (CTSD). incorporate the amended versions of the CPL Requirements Document, ETAD and CTSD into the SEC on 13 March 2019 as SEC v6.9. The Government response and associated documents listed below can be found on our news webpage. The Draft Budget for the Regulatory Years 2019 – 2022 was approved by the SEC Panel on 15 February 2019 and will become effective on 1 April 2019. You can find a copy of the budget and the SEC Panel’s response to the comments received on the consultation here. We’ve seen a recent upsurge in SEC Parties who have ceased trading in the last six months. When this happens, Ofgem will appoint a Supplier of Last Resort (SoLR) to safeguard customers. Numerous Codes, the DCC and Stakeholders are involved in the process required to enable a smooth transition of customers to the new supplier. In February, SECAS, the DCC and Ofgem met to discuss and update process maps for the different types of SoLR scenario. Further workshops are planned to continue this work. The minutes from the workshop and Process Map can be found here. Please note these minutes can only be read by SEC Parties who will be need to be logged in to the website to access them. The government has published a response to its consultation on helping businesses improve energy use. Most of this relates to energy efficiency measures and the way the market works for energy efficiency, but there is some content on data and aggregation. BEIS has published its response to questions raised as part of the tender process for the Smart Energy Savings innovation competition. The purpose of the competition is to develop and trial innovative feedback products and services that use smart meter data, to help domestic customers reduce their energy consumption. You can see the responses here and more details of the competition here. The closing date for submissions is 25 March 2019. The Default Tariff came into force on 1 January 2019, with the second cap period announced in February, for the period April-September 2019. Ofgem has already indicated that the cap level will rise due to changes in market prices. When the cap was introduced, Ofgem considered that costs related to the smart meter rollout were uncertain. Ofgem has now published an open letter on how the Smart Metering component of the default tariff cap will be calculated for future tariff cap periods. See the open letter on Ofgem’s website. Data is at the heart of Smart Metering and so we thought readers may be interested in this blog piece from Ofgem. Read more on the Ofgem website. Gemserv has launched an industry consultation on proposals for an Electric Vehicle Governance Framework (EVGF), to which we invite responses by 18 April 2019. Gemserv wants to better understand the challenges that participants face in the EV market and determine how a collaborative and industry-led EVGF can support the uptake of EVs and the growth of this market. Depending on industry feedback and appetite to support an EVGF, steps will be taken over the summer to establish an industry forum to oversee the full development of the EVGF. Please send your completed reply forms to strategy@gemserv.com by 18 April 2019.